Do you want a smart and powerful dog as a companion? The German Shepherd Rottweiler mix has both of these qualities and makes an amazing companion for those who can live with this powerful animal. The thing with mixed breed dogs is that we can only make predictions about their behavior, health concerns, appearance, etc. because everything depends on how their genres are ultimately expressed. So, in this blog, I’ll talk about the awesome German Shepherd Rottweiler mix and everything there is to know about this breed! So, are you ready to know this dog? I have divided this section into smaller sections for the sake of your understanding. In this section of the article, I’ll go over a few things like the aliases, the expression of genes, and the basic looks of the German Shepherd Rottweiler Mix. The Various Aliases That The German Shepherd Rottweiler Mix Goes By! Since the German Shepherd Rottweiler Mix is the mix of two different breeds, it goes by various aliases that merge these two names together. There are a lot of names that are used for this doggy. The Shottie is a designer breed that is a result of mixing the second most popular dog breed—the German Shepherd—with the ninth most popular dog breed—the Rottweiler. Of course, the Rottweiler and the German Shepherd are the most recognizable dog breeds and the Shottie gets the best of the both worlds! In this section, I’ll very briefly touch the subject of the Rottweiler Shepherd’s parentage. As I have previously discussed, predicting the looks of a designer breed dog is a gamble and the parentage has a big role to play in how your dog will turn out to be. The German Shepherd is a tall, medium-sized dog that has a muscular body and weighs between 50 – 80 pounds. This dog is a herding breed. The Rottweiler, on the other hand, is a large and tall dog. The dog has an intimidating and powerful physique and weighs between 75 – 129 pounds. This breed likes to work. The physical appearance of the German Shepherd Rottweiler Mix totally depends upon the way his genes are expressed. This means that one pup may look a lot like a German Shepherd while the other might look like a Rottweiler. Usually, from what I’ve seen, the German Shepherd Rottweiler Mix puppies tend to get their coloring from their German Shepherd side of the family while the facial features from the Rottweiler side of the family. But there is no hard and fast rule. German Shepherds have a thick and a medium length coat while the Rottweiler sports a thick and short coat. Now, chances are that the dog will have a coat closer to that of a German Shepherd, but it is too hard to say anything for sure. Your German Shepherd Rottweiler Mix will need some good grooming and regular brushing. I would strongly suggest that you start grinding the dog’s nails as early as you can and buy some good dog grooming brushes. I recommend the Petter Pet Grooming Brush and the Hertzko Self Cleaning Slicker Brush if you’re looking for a good dog brush. In this section of the article, I’d like to go through the basic behavior traits of the German Shepherd Rottweiler mix. As you know by now, most of the traits are inherited by the dog from its parents. We can’t be 100% sure as to which of the traits are dominant in your dog’s behavior. That being said, let’s dive in! 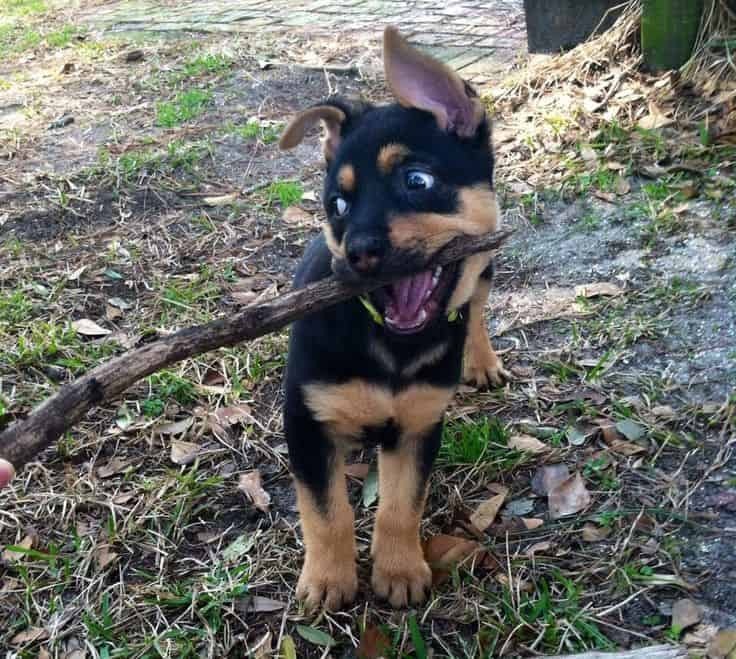 The German Shepherd Rottweiler mix is a very intelligent little doggy. Intelligence runs in its blood since both of this dog’s parents are known for this trait. So, I can assure you that this doggy will be very sharp and easy to train! German Shepherds are known to be great guard dogs and this is one of the traits that the German Shepherd Rottweiler mix has inherited from that side of its family. So, you shouldn’t worry too much about yourself (or your home) if you have a Shottie for a pet! This dog has a mind of its own and is extremely confident. The fact is that both of this dog’s parents are known to be very confident and bold—a trait that this dog was bound to inherit! If you know anything about this dog’s parents breed, you know that they are as loyal as any dog can be. Depending on the dog, you furry friend could either be a family or a one-master dog. This dog is an alert one and always on the lookout for potential threats. If you live in a relatively unsafe neighborhood, then, having a German Shepherd Rottweiler mix for a pet is a very good idea. The German Shepherd Rottweiler mix is a very devoted dog and always tried to please its master. 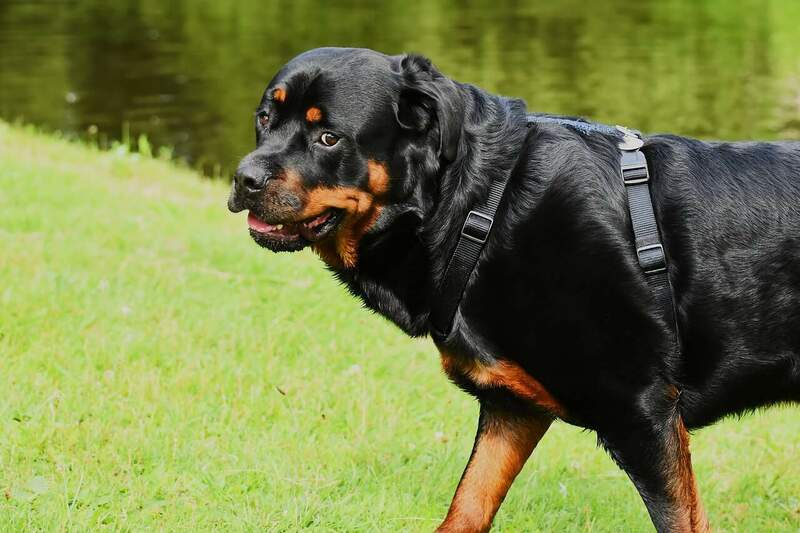 This is a trait that this breed inherited from the Rottweiler side of the family. Rottweilers are known to be calm and this trait is also inherited by the German Shepherd Rottweiler mix! The German Shepherd Rottweiler mix has nutritional requirements similar to those that of the German Shepherd. So, in order to find the best food for you do, you can take a look at a food guide that I wrote about earlier: Best Dog Food for German Shepherds. I would encourage you to consult a vet for a good diet plan for your dog because they will be able to guide you better about your dog’s nutritional needs, health concerns, and sensitivities. Some vets consider fresh prepped homemade dog food to be superior to other dog food but just like humans, sometimes cheap fast food is needed to save time and money and that’s okay! One high-quality and inexpensive dog food that I would recommend to you is the Taste of Wild Canine Formula. Each and every dog breed has a few health concerns that dog owners need to be on a lookout for. And, the German Shepherd Rottweiler Mix is not an exception to that rule. In this section of the blog, I’ll like to go through a few health concerns that plague this breed. Yes, cancer also affects dogs. In fact, it is the leading cause of dogs over the age of 10! Your Shottie’s parentage makes the dog more prone to this disease. So, you should keep an eye out for the symptoms of cancer on dogs. For some reason, the German Shepherd Rottweiler mix is really prone to getting eye diseases such as cherry eye, conjunctivitis, dry eyes, etc. Most of these eye diseases are treatable. Heart diseases in dogs are treatable as well as curable. If the heart diseases are left untreated (or unnoticed) they can even cause death! You can read more about the heart diseases in dogs over here. The German Shepherd Rottweiler Mix is a good-natured, confident and loyal dog which is the result of the union of a German Shepherd and a Rottweiler. With designer or mixed breed dogs, it is really hard to predict how the genes will be expressed. So, this means that one puppy could have physical as well as temperamental traits totally different than that of another puppy from the same litter! I hope I was able to explain everything that you needed to know about the German Shepherd Rottweiler Mix to you! I appreciate how you broke it down into sections. I now have more knowledge on the mix breed and feel very positive and excited in my decision to adopt a loving dog and give him a loving and forever home ❤Thank you!!! Love the article and gave new info on some things we didn’t find. Well I had to admit, this mix is pretty cute! I think I’d rather just have a full blooded German Shepherd though, I love those dogs. But I do love that Rottie coloration! So how the puppies will look will depend on the gene expression of the German Shepherd- since the Rotty will have Black and Tan Recessive genes- while German Sheperds could have the Sable Dominant Gene…. This means if you cross a Rotty with a “Sable” GSD- you will get a lot of sable + black&tan/rotty colored shepherds. If you cross a Rotty with a “Black&Tan” or “Black” GSD- You will get mostly rotty colored shepherds- AKA the result of the coloration most people are looking for!